Sometimes it can be hard to identify what the cause of your low self-confidence is. It might be something that you’ve never really thought about or maybe it’s too difficult to determine when it first started. Whether you know or not you know exactly what the cause is, there are steps that you can take to build your confidence and bring your self-confidence,self-esteem up to where it belongs. 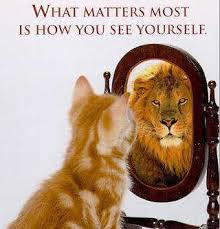 The way that you think about yourself has a huge influence on your self-confidence. If you keep telling yourself that you’re no good, you might just start to believe it even though it’s not true. If you notice that you practice negative self-talk often, check out some ways that you can challenge your negative thinking and build your confidence levels. My personal opinion at least once read ‘The secret’ book or watch movie based on this book. It’s just tells you what you think again-again and somewhat same things happen in your life too. It can be really tempting to measure our own worth against other people. So what if your friend is awesome at table tennis and gets great marks? You just need to figure out what your niche is. Everyone is great at something - what are your strengths? Gosh, I seem to put this one on almost every list. Exercise has been one of my most empowering activities in the last couple years, and it has made me feel so much better about myself. All you have to do is some kind of exercise whether in gym or yoga or at least brisk walking and you’ll see benefits. Start the habit. Everyone on this earth makes mistakes – it’s in our basic human nature. Why should you be any different? When you goes wrong, don’t stress, just learn from it and move on. There’s no point wasting all your energy thinking about things that you can’t change. Why don’t you have a think about some of the things that are in your power to control and see what you can do about those? Start small and work your way up – you can’t expect any huge progress to be made overnight.So always remember celebrate every little success you get and believe me you will feel more enthusiastic and refreshing to achieve your main aim. Not only is helping people a great way to boost the moods of others, but you might find that you feel better about yourself after doing something particularly excellent. Don’t hang around people who bring you down. Find a group of people who make you feel good about yourself and avoid those who tend to trigger your negative thinking. Remind yourself to stand tall and straight, I feel better about myself. Imagine that a rope is pulling the top of your head toward the sky, and the rest of my body straightens accordingly. As an aside, people who stand tall and confident are more attractive. That’s a good thing any day, in my book. If you are a complainer and you focus on problems then change your focus now. Focusing on solutions instead of problems is one of the best things you can do for your confidence and your career. “I’m fat and lazy!” So how can you solve that? “But I can’t motivate myself!” So how can you solve that? “But I have no energy!” So what’s the solution? Try to get solution instead of focusing on problem. Remember Problems... A ladder to achieve success..!! If you’ve tried putting these tips into action for a while and you haven’t noticed any differences in the way you feel about yourself, it’s a good idea to talk to someone you trust about it, like a friend or family member. You might also want to make an appointment with a counselor who can work with you to figure out exactly what’s at the root of your low self-esteem, and how to fix it. Dealing with self-esteem isn’t easy but these people are there to help you if you want it. 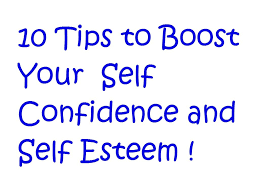 Nicely framed ways to boost self-confidence.Thanks for such post.. Most welcome dear.Keep reading and keep sharing..! !